STUMMEYER, Sabine (2017) Guidelines for Open Educational Resources for Libraries and Information Institutions. Paper presented at: IFLA WLIC 2017 – Wrocław, Poland – Libraries. Solidarity. Society. in Session 112 - Poster Sessions. „UNESCO believes that universal access to high quality education is key to the building of peace, sustainable social and economic development, and intercultural dialogue. Open Educational Resources (OER) provide a strategic opportunity to improve the quality of education as well as facilitate policy dialogue, knowledge sharing and capacity building“. Libraries and librarians have the task to facilitate unrestriced and free access to information to everyone. This includes Open Educational Resources (OER), which enable their users to retain, reuse, revise, remix and redistribute – the „5R“ of David Wiley about OER - open content. Libraries have a traditional affinity to learning material, public libraries especially in the school sector, acadmic libraries in higher education. Moreover the importance of OER for public as well as for academic libraries increased continually during the past years. But what are the main issues for libraries and librarians that they need to consider? Where do they get reliable information about these issues? 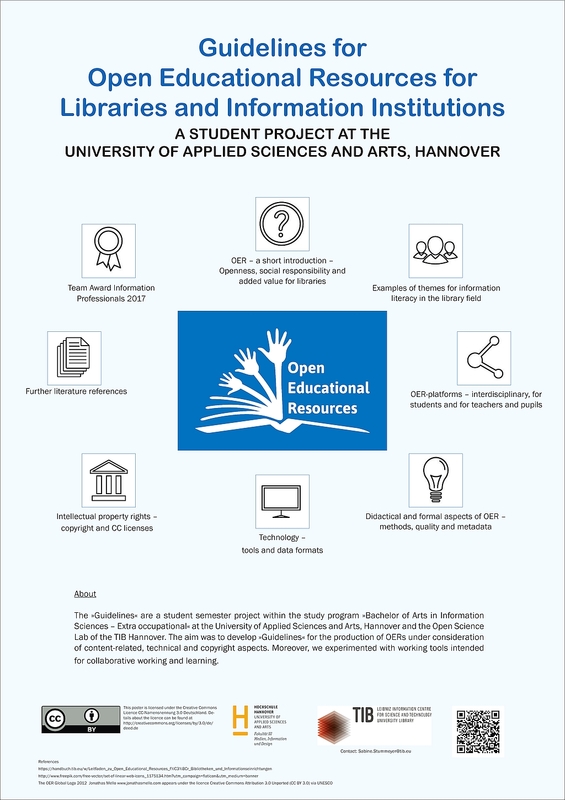 A semester project at the Applied University of Hannover identified six main topics and described them in the library context using „handbuch.io“, an open source platform for collaborative writing. During the writing process the project was visible and open for comments for everyone. Using a cc-by licence makes it possible for everyone to retain, reuse, revise, remix and redistribute this OER for librarians about OER. A DOI makes it permanently quotable.